In all honesty, I've only ever had a passing interest in Teen Titans. I generally don't like teams very much, including the Justice League, because in those titles we rarely see our heroes as their alter egos. I think there's an imperative dynamic that is lost when we don't experience that dichotomy. These super-teams don't always set the best example, anyway, what with all their bickering and pouting. Sure, there are plenty of examples of good, even excellent team-ups (Cosmic Odyssey, Darkseid Rising, potentially Justice League Dark), but I prefer my superheroes to mostly do their good deeds on their own. With all that said, the relaunched Teen Titans was a pleasant surprise. Story - 3.5: The opening sequence gives us our first (future) Titan, Kid Flash, complete with jerky charm and homemade costume. Kid Flash's leap-before-you-look attitude is well intending, but epitomizes the fears and concerns that the world has with the rising population of teenaged metahumans. In such are the foundations of the plot: these kids need to be brought under control. Tim Drake realizes that he has to get his fellow talented Generation Y'ers rounded up before the ill-natured organization N.O.W.H.E.R.E. does. This provides for a nice little back-and-forth between Drake and Zaniel Templar, N.O.W.H.E.R.E. 's glorified goon. We are treated to a cool, prepared, and thoroughly capable Tim Drake who has little trouble sending Templar and his lackeys packing. Enter Cassie Sandsmark, aka Wonder Girl (but don't you dare call her that). Her recklessness puts up a red flag that's easily spotted by N.O.W.H.E.R.E. Drake, now sporting Red Robin full regalia, swoops to her rescue, a gesture which is soon reciprocated. Wonder Girl (...oops, sorry. Don't call her that) is given a bit of action and plenty of panel space to show off her skills, and they're nothing short of potent. The short tête-a-tête between Drake and Sandsmark shows us a now fragile seventeen year old girl who, after fully revealing her power, is afraid that her life will now never be the same. In comforting her, it's great to get a glimpse of Drake's gentle leadership budding in this first issue, coupled with his innocence ("What does that have to do with anything?"). The story ends in the same place as Lobdell's Superboy #1, with Templar ordering Red to "release the Superboy!" This is the only mentioning of Superboy in the issue, and the last panel almost mirrors that of Superboy #1. Reading Superboy #1 isn't necessary to know what's going on here, but it certainly wouldn't hurt. Teen Titans #1 doesn't give us much to see in terms of the team. We really only get to know two of them, but we get to know them fairly well through dialogue and consistent action. This isn't a remarkable story, but it is fun, and the characters are highly likable. 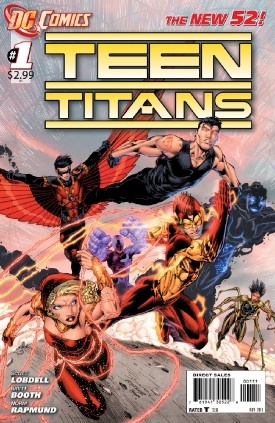 For new readers using the New 52 as a hopping on point, Teen Titans #1 delivers. Art - 4: I really like Brett Booth's pencils. He's fantastic at action sequences, providing the illusion of movement through simple and sparing use of lines. I love his Kid Flash costume here, complete with stitch lines, painted-on lightning bolt, and swimming goggles. Nothing says "homemade superhero costume" like cheap rollerblade kneepads. I really love Red Robin's new costume as well. The way his wings hang like a cape is a smooth touch. Booth also has an attention to detail that doesn't speak so much for his artistic skills, but rather for his love of precision; the mud on Red Robin's boots and the stains on Kid Flash's sweater attest to his care for how the main characters look. Norm Rapmund's inks are well placed throughout and the choice of colors is spot on. Cover Art - 3.5: The cover isn't bad, but it is deceiving. Covers are often notorious for having nothing to do with the story, and this cover is guilty of that. I have mixed feelings about the Teen Titans logo. It's a bit blocky for my taste, but given that it's rather titanic, it's suitable. This isn't as epic as George Pérez's The New Teen Titans #1, but it does the job for the first issue of a relaunched title.